Dates stuffed with garlic and wrapped in smoked country bacon served with a peppery honey demi-glaze. A la bourguignonne, hand picked very clean escargot from France. Sweet Bahamian conch, thinly sliced, sprinkled with Asiago, capers, red bell peppers and red onion. Served with virgin olive oil and key lime juice. Chef Correa's signature appetizer. Stuffed with garlic and crab meat. Served with greens and toast. Imported from France, cleaned and marinated in olive oil and garlic. Served on crostini with our famous green remoulade sauce. Backed on crostini and served with a baby greens salad tossed with a white truffle vinaigrette and avocado mousse. Served with a mango salsa, made with jalapeno, onion, cilantro and lime juice. Prepared daily with fresh ingredients, please ask your waiter. Ripe tomato's and cucumber with red bell's and garlic make this the best-chilled Andalusian soup you never had. Rated to die for by local enthusiasts! Cafe sole's & chef Correa's most famous soup. Winner of the great "chef's classic" and overall best soup in Key West. Portobello mushroom and onion with white wine, port and a touch of cream. Chef Correa's infamous tender and delicious conch chowder. This is what you always knew conch chowder could be. Conch, caramelized onion, grilled corn, potatoes and cream make this dream a reality. Simply perfect. Lobster meat, caramelized onion with port, tomato, and cream. Basta! Silvered onions slowly caramelized, finished with champagne, port, and demi-glaze. Baked in the oven with toasted baguette and a Gruyere mixture. Bon appetite. Ripe Roma tomato, silvered crescent of Bermuda onion, Kalamata olives tossed with our fabulous balsamic vinaigrette and finished with a light fresh French goat cheese. Imported from the Dominican Republic, served with an avocado vinaigrette and shrimp. Wild baby greens with ripe pears and toasted pecans tossed in zesty lemon vinaigrette topped with maytag blue cheese. Hearts of romaine served with a spicy dressing and crostini. Ripe roma tomatoes, fresh mozzarella, pesto, fresh basil, drizzled with olive oil and a balsamic vinegar reduction. Fresh local shrimp, scallops and calamari tossed with garlic and served over angel hair pasta with three sauces. With a hoisin garlic sauce and wasabi cream. With a roasted red pepper zabaglione. A delicate white meat with the flavor of shrimp, caught exclusively by divers. A sunburst of tropical flavors. Yellowtail snapper sauteed and served with a mango salsa. Black grouper served with our spicy, roasted red pepper and hazelnut sauce with garlic and tomatoes. Grilled and served with drawn butter. With shrimp, mussels, scallops, grouper, fresh vegetables and homemade broth...the real French fish stew. Served with a creamy vanilla bean and saffron sauce. 8oz grilled lobster tail and 10oz filet mignon. Backed with herb de provence and garlic. Duckling roasted to perfection with our classic orange sauce made with fresh orange juice and demi-glaze. 10 Oz. Filet Mignon "Casanova"
Served with a wild mushroom demi-glaze with foie gras. 12oz. Beauty, grilled and served with melted maytag blue cheese, roasted garlic cloves and roasted red pepper. Café Solé has captured the hearts and palates of locals and visitors lucky enough to discover this culinary gem off the beaten path since 1995. 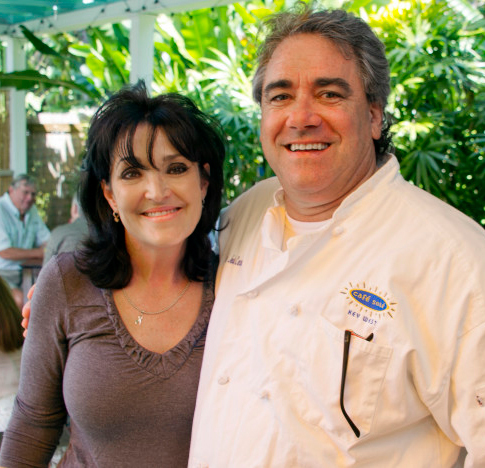 Chef John Correa, together with his wife Judy, combine his French mastery of sauces with fresh locally caught seafood. John has created a menu unlike any on the island, where every dish is bursting with indescribable flavors. Mutton Snapper in pesto and champagne, Yellowtail in a beurre blanc of lobster or a rare Hog Snapper with red pepper zabaglione top a list of nightly specials. As for the classics, the Duck a L'Orange, Rack of Lamb with herb de Province and Lobster Bouillaise are as authentic as you will find this side of Paris. Chef Correa combines the best of both of his worlds, European and Caribbean to win the People's Choice and Best Entree awards at a recent Master Chef’s Classic competition. Additionally, Cafe Sole has been voted best food in the Florida Keys by Zagat Magazine! Come visit us for a taste of France that you will never forget!